You can find in Italy the largest water plants collection in Europe, in this article you could see how this passion was born who bring me to own that collection, one of the largest in the world. From the passion for pond fishing and the water features culture begins the passion for water plants, endemic plants of Piedmont lakes to begin, water lily “Alba” and “Nuphar Lutea”, a variety similar to water lilies that grows naturally in some ponds. Starting from this two species grown in a small pond behind home start the search for new species and variety of those plants that needs few care and gives huge satisfaction. The search started in nearby nursery, in Canavese, northern zone near Turin, from smallest to largest, looking for their water lily availability. Some with few plants, some more, I find new water lilies variety to grow in my pond that grows year by year, adding new pots and ponds to add more space to grow the new plants. Other way to find information and new plants was the web, thanks to internet I could find further information about it, more specialized nursery in water plants in Italy as abroad. I noticed that in Italy there weren’t website about ponds and aquatic plants I thought to create one by myself, bringing people to this beautiful passion and meet people who are already passionate to these plants. From that idea was born, in 2001, the website www.laghetto.it, were anybody can find information about pond plants and fishes for Italian people with a forum that is one of the most active about that subject. Thanks to this website I meet many passionate like me with who was possible exchange information, opinion and also plants. Working on my web research I found many English spoken website thanks to which I increased my knowledge about the aquatic plants, differentiations, genera, species and varieties. I started to buy plants abroad, variety that still did not exist in Italy, and the number of ponds and tanks behind home was slowly growing and expanding. In addition to water lilies I also started to cultivate lotus flowers and other plants adapted to wetlands or aquatic. The collection of water plants was growing more year by year, from plants exchange to plants bought in Italy and abroad, common and rarest plants. My research is based on the proper verification of the variety of plants found in my collection, all the plants I’ve got are grown and I verify that the plant is really the one I bought, and in case I have doubt about correct variety it is removed from my collection. The latter is one of the things that I consider most important, especially if the plants are intended to be sold, who will receive a plant from my collection must be sure of the variety that will buy, because every plant has got his own characteristics such as flowering, size, beauty, and it is correct that those who buy a particular plant receives exactly that plant and not a similar variety. As the strong expansion of my water plants nursery, thanks to my parents help, I bought a new piece of land of about 5.000 square meters where achieve my dream, the dream to create a unique display of aquatic plants in Europe, starting to create display and cultivation ponds for all my plants. Starting from the purchase, done in 2010, I build many ponds, covering more than 1.400 square meters of land with water surface and the same and more will be done in the next year, to cover more than half of my land with water surface for water lilies, lotus flowers and other bog plants display. I already started to specialize in bog iris growing, iris variety that lives in wet lands or submerged with water, that should be grown even in pots. 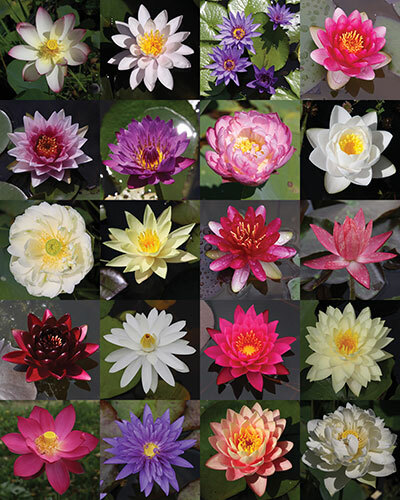 While I’m writing, my water plants collection is composed of 300 water lilies variety, about 40 tropical water lily, more than 150 lotus variety, 400 bog iris, and many other kind of water plants, bog, submersed and floating. All that variety are visible prior phone appointment in Feletto (TO) Italy. Water lilies, from April to September. Lotuses, from the end of June until august. Tropical water lilies, from July to September. Water irises, from the end of April to June, depending on the species.